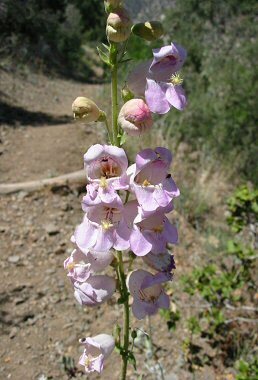 Palmer's Penstemon is a member of the Figwort Family. The plant grows to 5 feet in height and can be found on roadsides, washes and mountain slopes between 3500 - 6500 feet in elevation. Leaves are grayish green and toothed with a waxy coating and grow in pairs on opposite sides of the stem to 5 inches in length. Palmer's Penstemon is also known as the scented penstemon for its pleasing smell. Palmer's Penstemon blooms between March - September and produce fragrant, pink, snapdragon-like flowers which grow in clusters along the upper stem.